The medical Course taught in English of the University of Pavia – known locally as the Harvey Course – admitted its first students in 2009/10. Since then the Course has admitted up to (or close to 100 students per year). The initial student population was largely Italian (>85%) and the intial ratio of applications to placements was …. 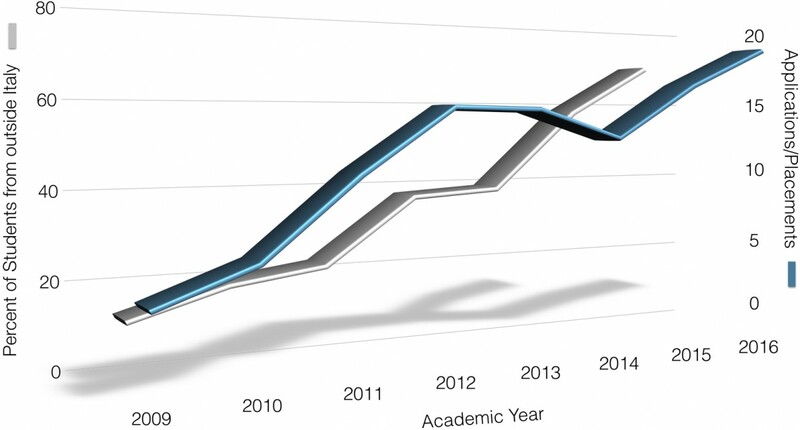 Both the proportion of Harvey students admitted from outside Italy and the overall number of applicants increased over the years especially as the result of a major Course revision that took place across the academic years 2012/13 and 2013/14 (see below) and the Harvey Course of the University of Pavia is now the Italian medical Course taught in English with the highest number of international students from EU countries, middle and far East and other parts of the world. Since Pavia launched the Harvey Course another five Italian state Universities have offered medical Courses taught in English. These Universities are: Milano Statale, Roma la Sapienza, Roma Tor Vergata, Bari, Napoli Federico II and Napoli Seconda Universita’. Two additional state Universities (Torino and Bologna) will offer a similar Course starting from October 2017 and three private Universities are offering similar Courses (La vita S Raffaele and Humanitas – both in Milan – and the Universita’ Cattolica in Rome. In October 2017 therefore a students wishing to study Medicine in English in Italy can choose between 12 Universities and the number may increase to 14-15 in October 2018. 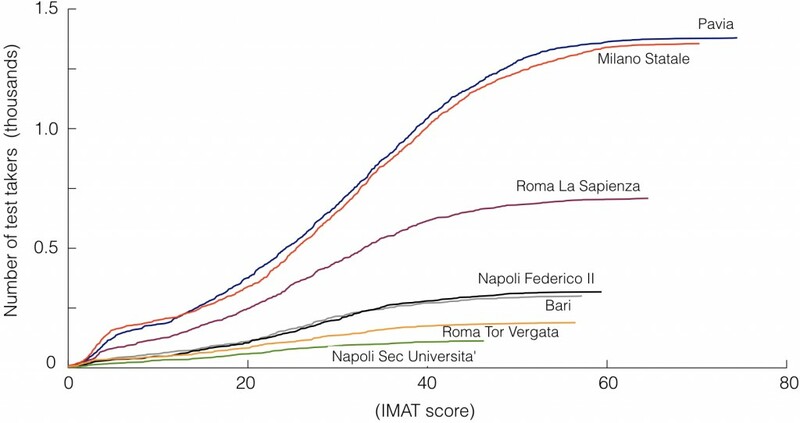 Notwithstanding the large number and diverse profiles of the Universities and Courses at stake, Pavia retains a leading role among the state Universities (see Fig below, data source: the Italian Ministry for Education, Universities and Research) followed closely by Milano Statale in terms of both number of applicants: ~ 14 applicants per placement, shown in the y axis and the IMAT score, shown on the x axis (the International Medical Admission Test, IMAT, is set and delivered by Cambridge Assessment on behalf of the Italian Ministry for Education, Universities and Research). Data for private Universities are not publicly available and thus are not included in the Fig below. During his studies on the morphology of the cells of the nervous system using light microscopy, in the early years of the 20th century C Golgi described an ‘organelle’ of unknow function. Half a century later electron microscopical and biochemical studies established a key role for the ‘Golgi apparatus’ (or Golgi complex as is also known) in the maturation of proteins targeted to the cell membrane or for extracellular secretion. The image at the top of the page is a transmission electron microrgaph of a typical ‘Golgi apparatus’. From: Velasco A et al. Cell type-dependent variations in the subcellular distribution of alpha-mannosidase I and II. J Cell Biol 122:39-51 (1993).